Trump and Kim sat next to each other and answered a few questions from the media. Trump said he hopes the historic summit would be "tremendously successful,” adding, "We will have a terrific relationship ahead" as he faced Kim. Displaying the national flag of North Korea shows that the US wants to express its sincerity and kindness to North Korea, Cheng Xiaohe, an associate professor at the Renmin University of China's School of International Studies, told the Global Times on Tuesday. 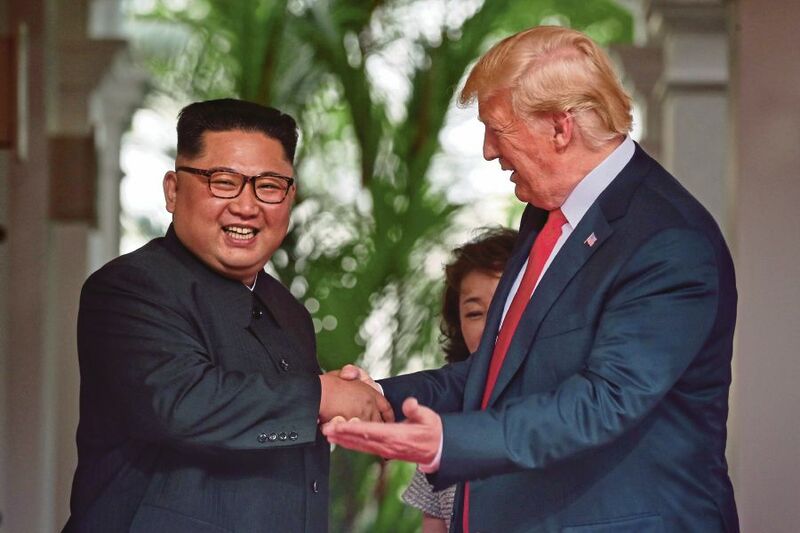 SINGAPORE: U.S. President Donald Trump said he had forged a "good relationship" with North Korean leader Kim Jong Un at the start of a historic summit in Singapore on Tuesday, as the two men sought ways to end a nuclear standoff on the Korean peninsula. "There will be challenges ahead," Kim said, but he vowed to work with Trump. Both men sat against in the hotel's library against a backdrop of North Korean and U.S. flags, with Kim beaming broadly as the U.S. president gave him a thumbs up. With cameras of the world's press trained on them, Trump and Kim displayed an initial atmosphere of bonhomie. "We overcame all kinds of scepticism and speculations about this summit and I believe that this is good for the peace," he said. While Trump and Kim search each other’s eyes and words for signs of trust or deceit, the rest of the world will be watching, hoping that somehow these two unpredictable leaders can find a way to defuse one of the planet's most dangerous flashpoints. Staff-level meetings between the United States and North Korea were going "well and quickly," Trump said in a message on Twitter on Tuesday. But he added: "In the end, that doesn't matter. We will all know soon whether or not a real deal, unlike those of the past, can happen!" On Tuesday morning, Pompeo fed the mounting anticipation of diplomatic breakthrough, saying: "We're ready for today." He added: "North Korea has previously confirmed to us its willingness to denuclearise and we are eager to see if those words prove sincere." The summit was part of a "changed era", North Korea's state-run KCNA news agency said in its first comments on the event. Talks would focus on "the issue of building a permanent and durable peace-keeping mechanism on the Korean peninsula, the issue of realising the denuclearisation of the Korean peninsula and other issues of mutual concern", it added. Ahead of the summit, North Korea rejected unilateral nuclear disarmament, and KCNA's reference to denuclearisation of the peninsula has historically meant it wants the United States to remove a "nuclear umbrella" protecting South Korea and Japan. Trump spoke to both South Korea's Moon and Japan's Prime Minister Shinzo Abe on Monday to discuss developments ahead of the summit.